It’s been said that marketing has changed more in the past five years than in the prior 40. I’m not quite old enough to validate that assertion first-hand, but I do know that marketing change is constant, and possibly accelerating. Last week, I wrote about the tsunami of artificial intelligence and the fact that robots and AI aren’t likely to steal marketers’ jobs so much as change the composition of marketers’ day-to-day duties. In addition to this data-driven reassignment of roles and responsibilities, the future (and present) of digital marketing also includes two all-new jobs that simply did not exist last year. Paid is more expensive that ever, and average results will continue to decline as the gold rush continues. We’ve seen this movie before when it was called “SEM.” No, paid digital promotion is not going away, but the low hanging fruit is picked. Thus, attention is swinging back to earned exposure (thus, the big rise in influencer marketing), and owned audiences (see the returning emphasis on email and YouTube subscribers, et al.). 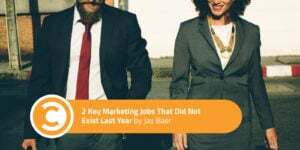 When he worked at ExactTarget, my friend Jeff Rohrs predicted this shift four years ago in his terrific book Audience: Marketing in the Age of Subscribers, Friends, and Fans. He just may have been ahead of the adoption curve a bit, which is not uncommon with business book authors. Heck, I’d argue that my first book, The Now Revolution, is truer today than it was when Amber Naslund and I published it in 2011. Content marketing strategy genius Robert Rose developed a new framework for measuring and valuing a brand’s total “audience” and argues here that someone on the marketing team must be charged with caring and feeding and thinking about that combined group. It’s not a community manager, and it’s not a content marketing manager (although both of those could be launching pads for this role). Instead, what is required is truly an “Audience Strategist” charged with protecting and growing the value of the collected attention from fans, subscribers, and followers of the brand. Audience segmentation: Understanding which programs produce the highest-quality audience members, and segmenting them into natural strata of business value. Audience integration: Working with disparate parts of the business to understand where and how having insight or access to audiences can help optimize the business strategy. I really like this construct, and am thinking about what it might look like here at Convince & Convert if we had an Audience Strategist. At present, like most other organizations, we have different people tackling disparate pieces of the duties above, and I wonder what a cleaner set of responsibilities might yield. Whereas the Audience Strategist is tasked with building and protecting the people who love the brand, the Digital Knowledge Manager is charged with building and protecting the data that is true about the brand. Remarkably, this role also came from the fertile mind of Jeff Rohrs, who is now CMO at publicly-traded software company Yext. Arby’s is currently offering a seasonal venison burger. Yes, it’s featured on their website, but how do Yelp, TripAdvisor, Waze, YP.com, Dex, Amazon’s Alexa, Siri, and the hundreds of other intelligent services know it’s on offer? Making that work is what Yext does. As we move more and more into new UI for data retrieval, being proactive about the facts about your brand becomes more critical. Structured data is the new FAQ, and the same way you needed a “Webmaster” when your digital presence pretty much started and stopped with your website, you now need a “Digital Knowledge Manager,” given that your digital presence is expanding outward without end. Jeff and I collaborated on a free ebook called “The Everywhere Brand” that talks about the growth of intelligent services and voice-based UI and what it means, as well as why a Digital Knowledge Manager is critical to be the ringleader of all this data. Works directly with employees across Operations, Marketing, PR, SEO, Paid Search, Social Media, and others. Acts as an internal educator to drive awareness of trends, changes, and new technologies, as well as consumer adoption and behavior change. Owns source tracking (internally) for all pertinent digital knowledge for the company, brands, products, people, locations, and services. Brands heavily invested in owned audiences that also have a lot of physical locations (thus, a lot of structured data that must be consistent) will need both an Audience Strategist and a Digital Knowledge Manager in their marketing organizations. Some companies will need one or the other. But I’d argue (and Robert and Jeff will concur, no doubt) that just about every brand of size will need at least one of these. When you actively manage something and make it somebody’s job to do just that, chances of success and growth increase. This is the case with audiences and with data consistency. Sure, you could continue to laissez-faire these responsibilities or split the duties between a few, existing digital marketers. But if you’re serious about owned, and you’re serious about the intelligent future, it’s time to create a new role or two and stop leaving success to chance.